Celebrate you next simcha at Chabad of the Town! Our beautiful new hall can accommodate up to 250 people for any occasion! We welcome you to host your next simcha with us, including Bar Mitzvah, Brit Mila, Naming Ceremonies, Sheva Brachot, and more. 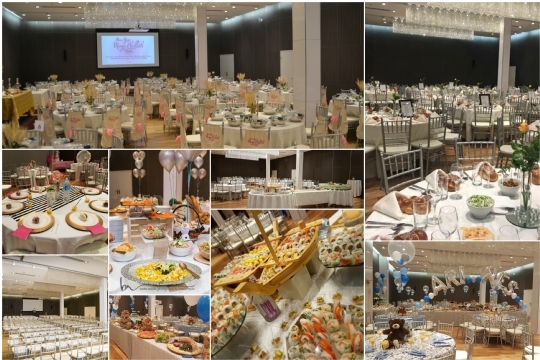 Our fully accessible, elegant and spacious accommodations are ideal for large or small receptions, breakfasts, luncheons and dinners. Our well-equipped Kosher kitchen is available to all Kosher certified caterers (caterers must also be approved by the Rabbi). From 20 to 250 people, casual to elegant, daytime to evening, there are several excellent options. What could be more perfect than a simcha at Chabad of the Town?